Back from a very enjoyable ride from Seville to Salamanca, averaging 40 miles a day with the longest being 60 miles. The Spanish really do like their meats (had some mouth watering secreto iberico, along with the chorizo, chuletons....) so it was something of a relief to get home to a bowl of home grown. If you've only space for one variety of rhubarb then I'd go for Victoria. It's one of the most popular and deservedly so. Thick reddish pink sticks and flavour wise it beats the Timperley Early and Champagne that I've got growing on the allotment. I don't stew it with sugar, instead I drizzle some runny honey in the bowl and serve with low/no fat yoghurt. I've got some rhubarb coming up in my new garden. I suspected one plant would come up, but until all 4 appeared I didn't know for sure I had any at all. All just left behind from the previous gardener. 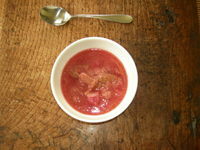 When I was a child, my grandmother who lived in Vermont grew a really delicious variety of rhubarb. If I had any way of knowing what kind it was and finding it, I would grow it again in a minute. The variety really makes a big difference in taste. I was thinking of trying to collect as many varieties as possible and grow them next to each other to find the best tasting one. The problem is, while I do like rhubarb sometimes, I don't really like it enough to grow so many plants.